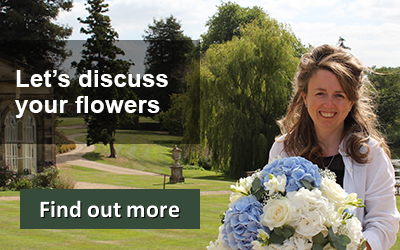 Here is my guide to help you choose the perfect wedding flowers that fit with your wedding colour theme. Below are some of our most popular colours. This is just a snap shot, I have created many different colour combinations over the years to fit with fashion, latest trends and personal favourite. Click on the images below to see more examples of our work. I love colour, it’s one of my passions and something I’m fortunate to have a talent for. I studied art and design before going into floristry and I’ve been able to transfer my artistic skills into floristry. Choosing and selecting colour combinations is not an easy task, but don’t worry I’m here to help and advise you along the way. When people come to me for a consultation some couples have a very definite wedding colour theme that we plan their flowers around. Sometimes flower colours can be based on the bride’s favourite flowers and other times we choose an accent colour to compliment a strong wedding colour theme. Many brides choose wedding flowers that pick up or compliment the colours of the bridesmaids dresses. I love finding out what people like and helping them to choose the colours that are perfect for them. I’m amazed how many people will say to me ‘I would never have thought of that colour theme‘ or ‘I’d never have put those colours together’. 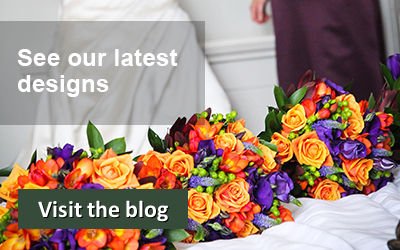 We have a massive portfolio of wedding flowers in all sorts of colour themes looking through them with me is a great way to help you select your own personal wedding flower colour theme.